Still love coloring this set! 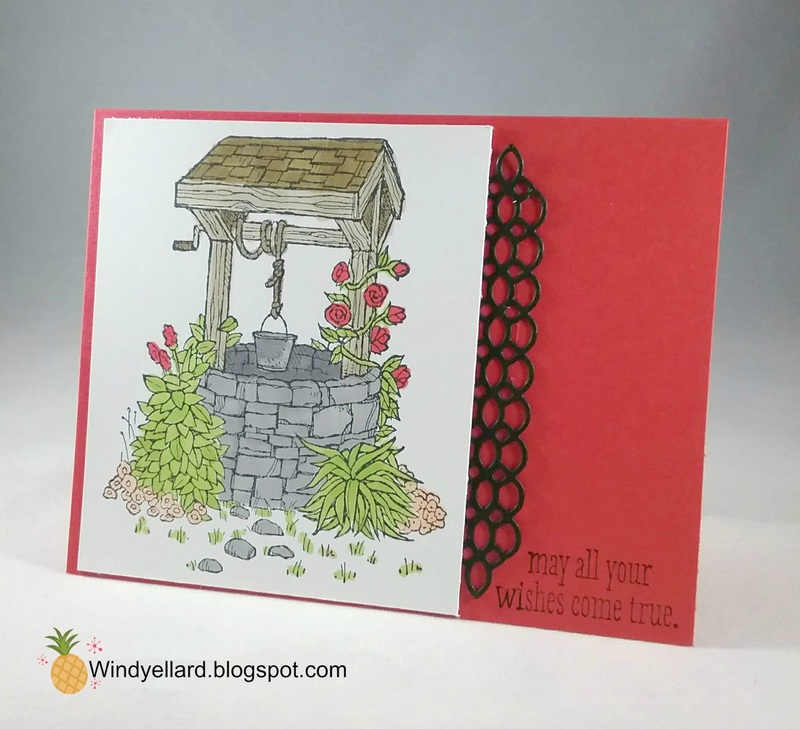 in Memento Tuxedo Black and colored it with my Stampin Blends markers. then a print from Nature's Poem DSP to tie in the Mint Macaron color. 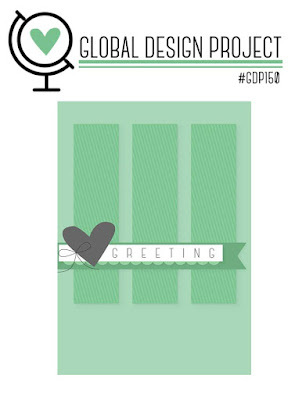 on white card stock and chopped off the end. this was the perfect color challenge to try it out. and layered it on a white base. Crushed Curry. I did hand snip these so they do not look so professional. I added the center in Soft Suede plus a few Suede dots. across and layered them on the background. except for the hand snipping part! Love this plaid...can make it in every color! 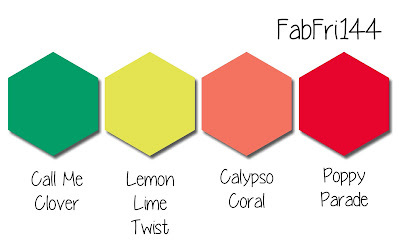 as well as beautiful colors! 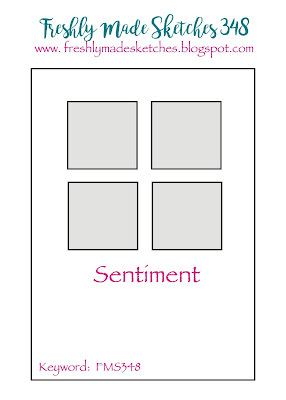 sentiment in Merlot from the Beautiful Promenade set. to layer on the first cut. I finished it off with a few pearls. I really think I love the Merry Merlot color, too! Great fall color as well as a Christmas color. You may see it a lot here soon! 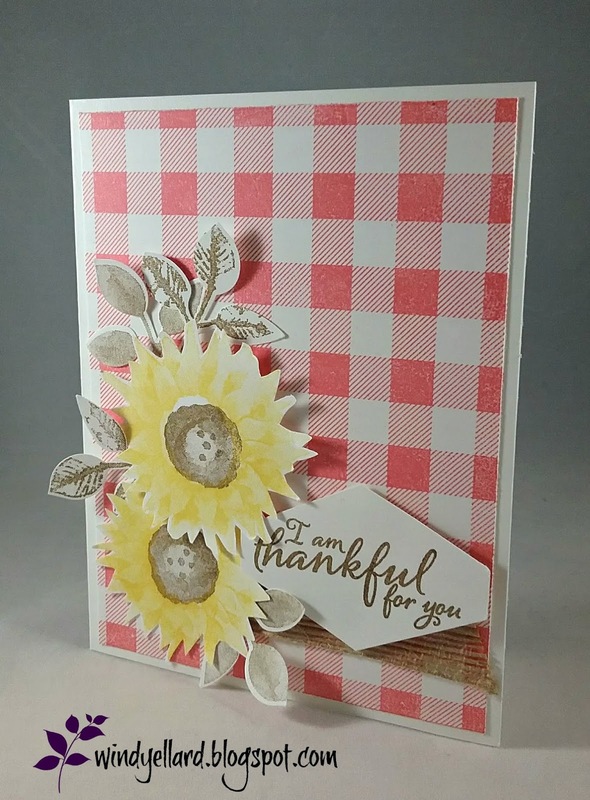 Country Lane suite is so awesome and great for fall. I love the new Tin Til folder I use here in Mint Macaron. 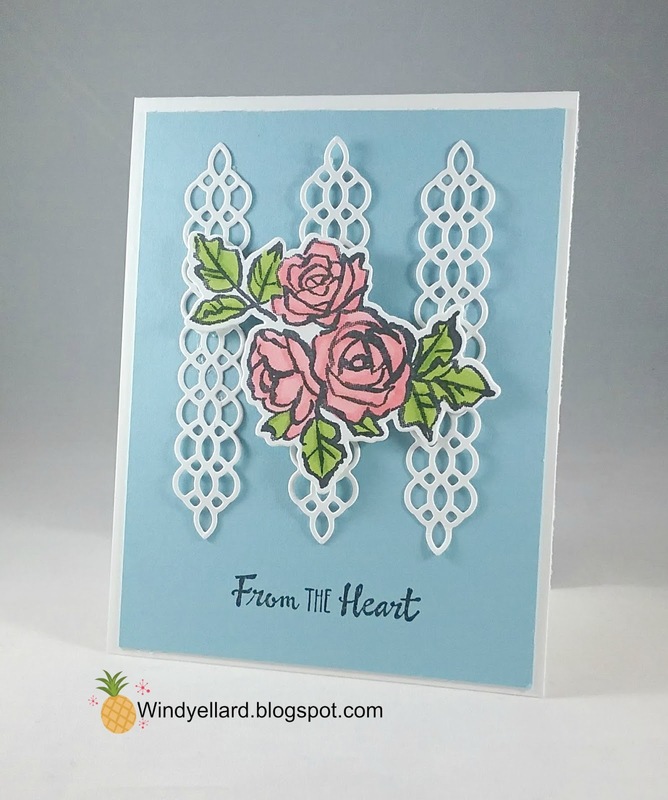 I layered it on a Mint base. markers in new fall colors. 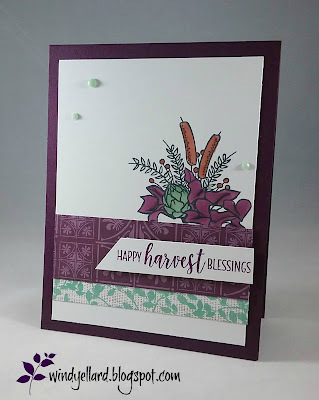 I stamped part of a sentiment in Blackberry Bliss ink. I added some chicken wire foil die cut behind. and white on the other side. which starts September 5th, 2018. This color combo challenge seemed to scream Tropical Chic bundle to me. them with the matching dies. 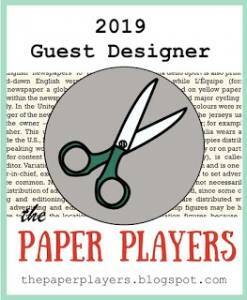 on white and cutting out. 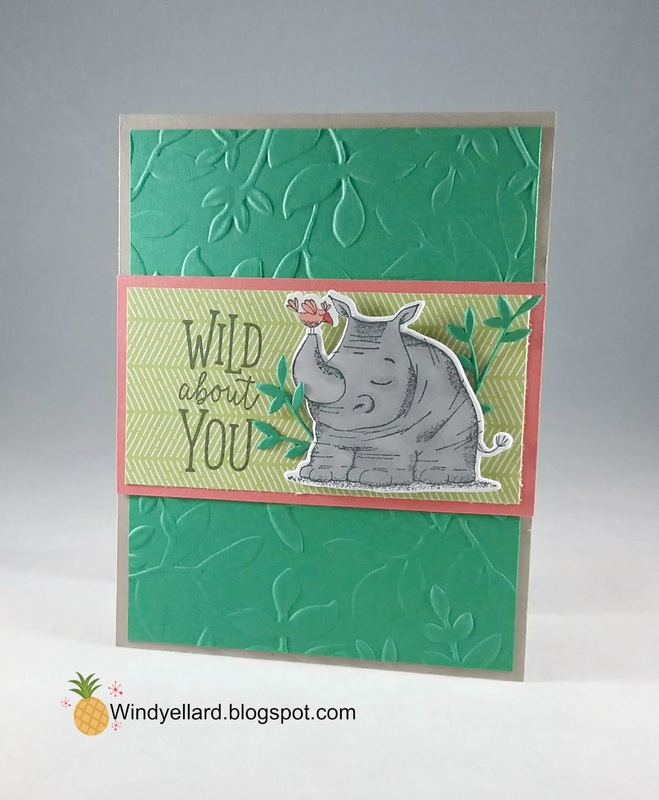 the Lemon Lime background print found in the Animal Expedition DSP pack. 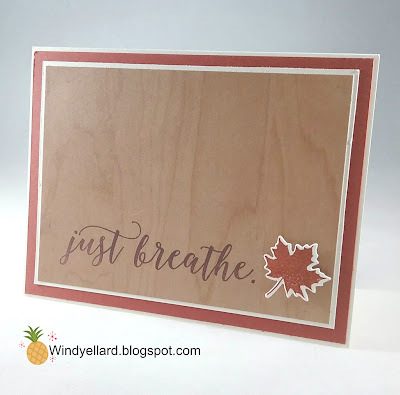 and cut it with the label die in Lakeside dies set. 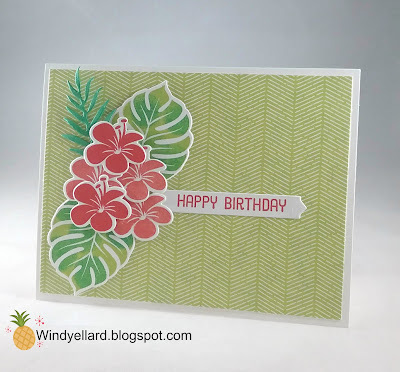 Fun tropical card in bright tropical colors! 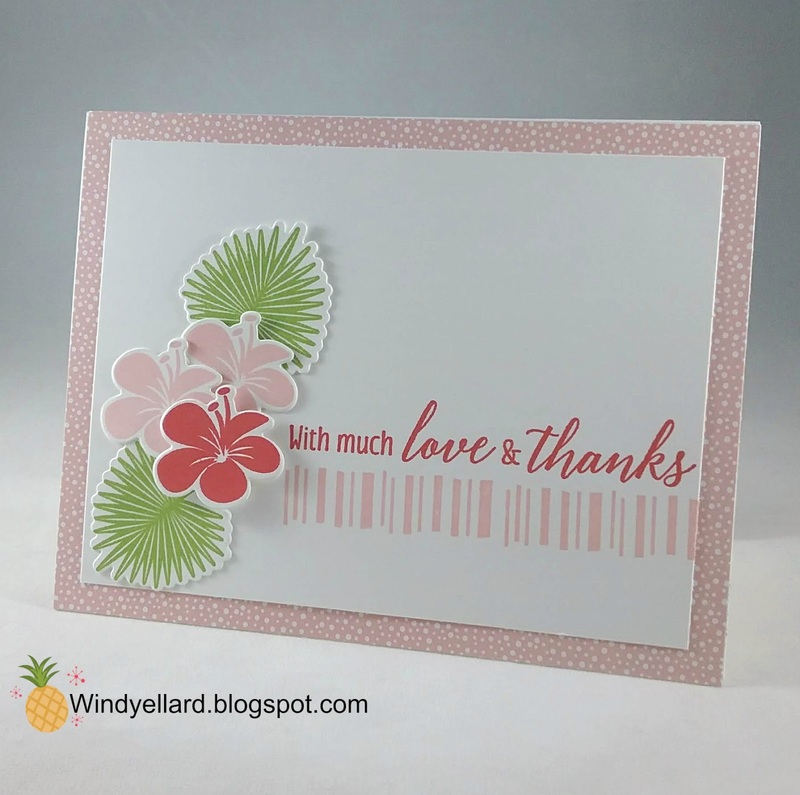 Thanks for stopping by here and have a ownderful day! in the Colorful Seasons bundle. in Cajun Craze and cut it with the matching die. 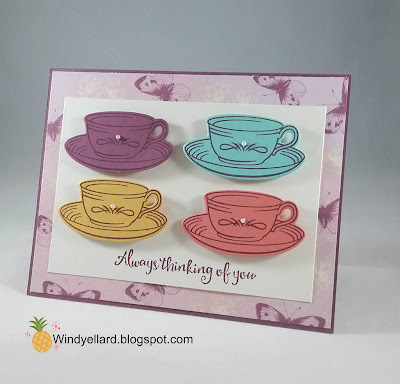 Some layers of Vanilla and Cajun finish off another simple card. 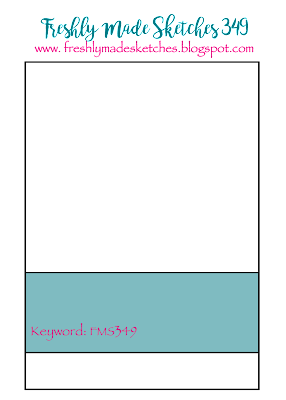 a piece of white card stock. along with the design in Blushing Bride. with the matching leaves stamped in Granny Apple Green. 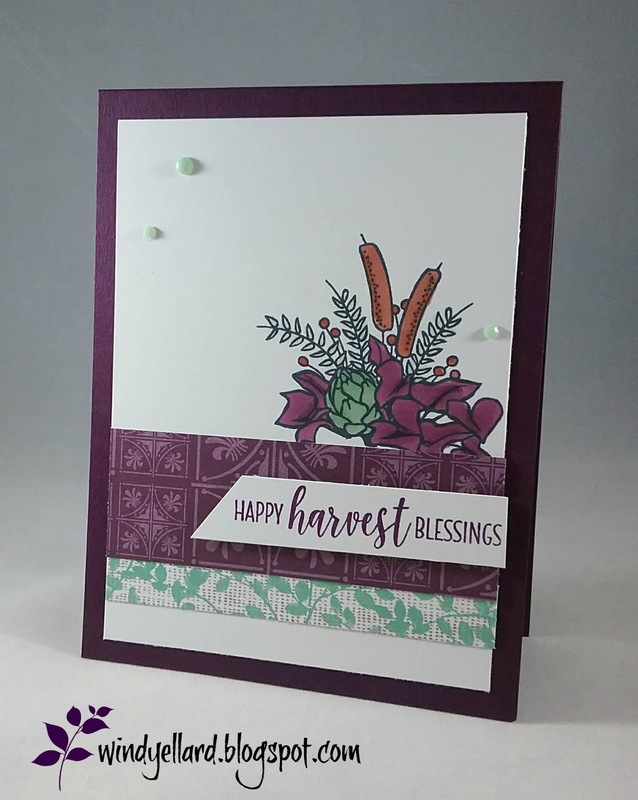 I combined Gorgeous Grape and Highland Heather here for double purple. I used Grape for the doily die and the layer under background. 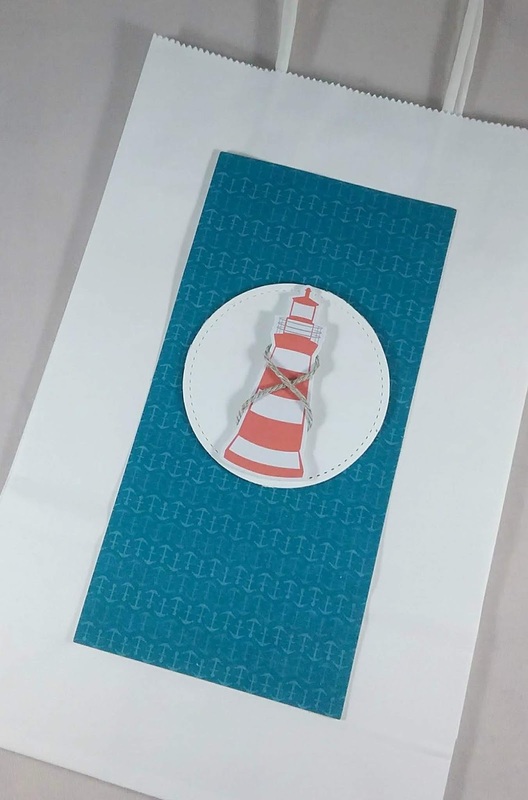 on white card stock and cut it out with a circle die. 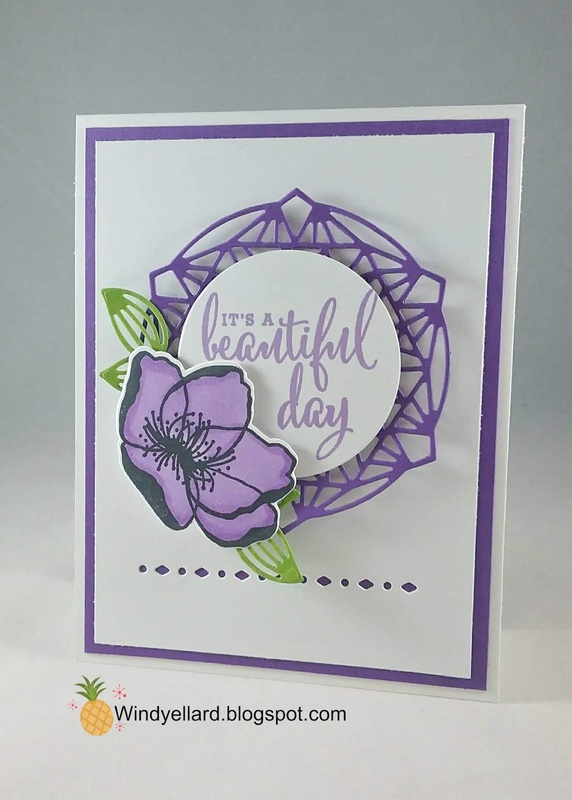 my Heather Stampin Blends marker then cut it with the matching die. I cut some leaves in Granny Apple Green card stock to add behind the flower. in the white background to show the Grape behind. I hope you have a beautiful day and thanks for stopping by! 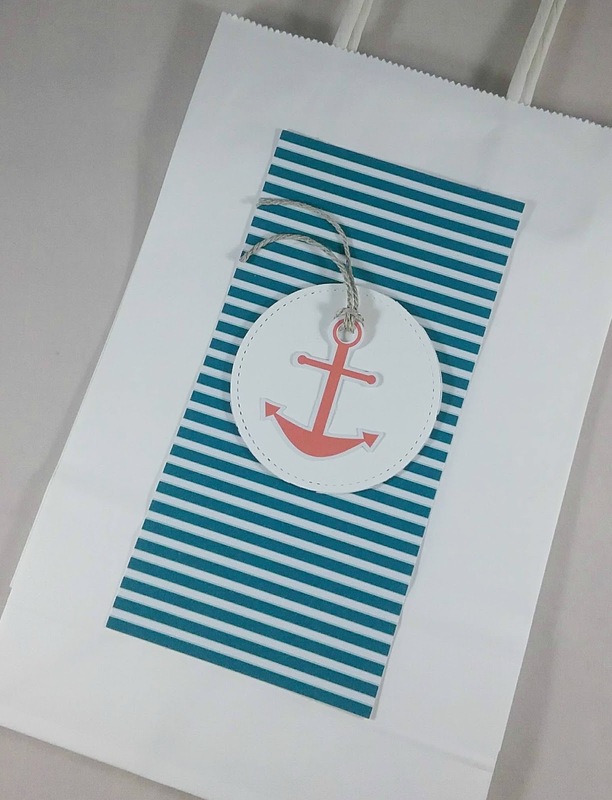 I decorated these white gift bags for my card classes this week. My guest carry their card home in a bag or box I provide for them. I used the April Paper Pumpkin kit called You Are My Anchor. added natural twine from the kit. to be used for any occasion. I do love Blackberry Bliss. So glad it came back this year. Perfect timing for lots of use in the fall! 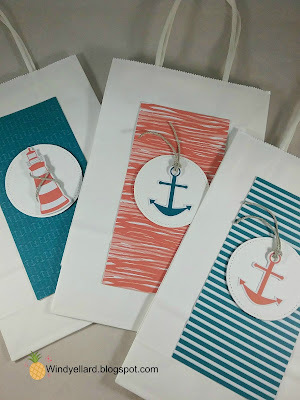 Black and colored them with my Stampin Blends markers. 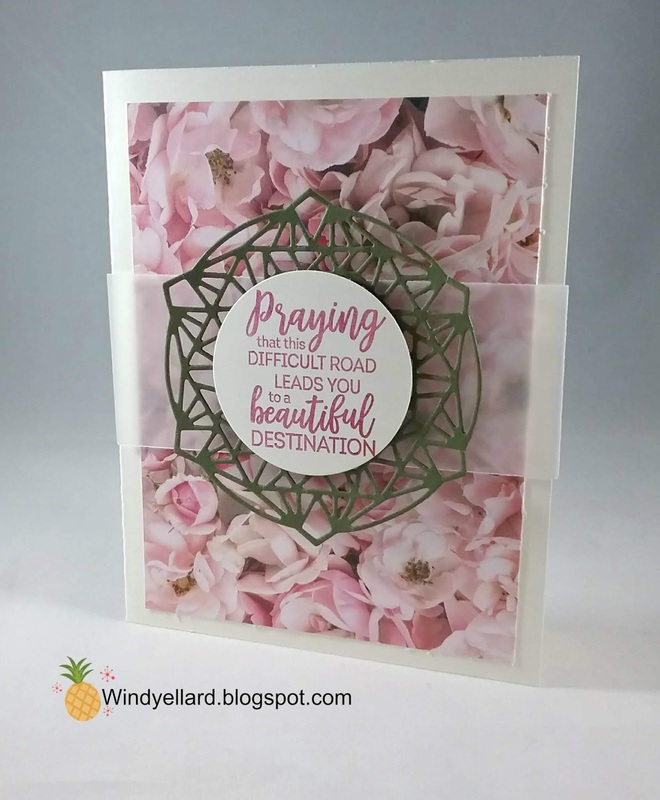 This new suite will be in the Holiday catalog starting Sept. 5th, 2018. I used my corner rounder on my envelope punch board for two corners. I added some burlap ribbon behind and in no time it was done! 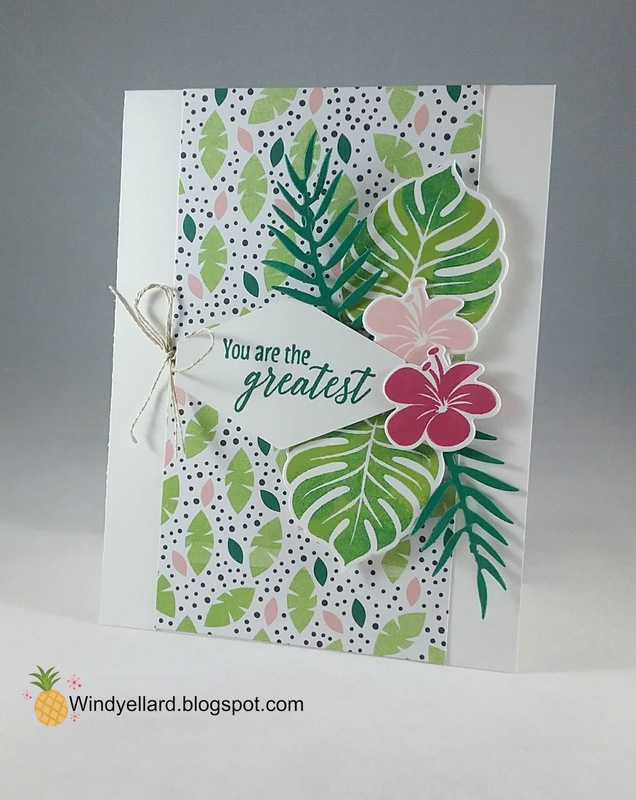 Last card for class using my fav suite-Tropical Escape! I layered a great print on the white base- cut 3" by 5 1/2". Shaded Spruce leaves cut from the dies called Tropical thinlits. some Shaded Spruce on them before stamping on white. 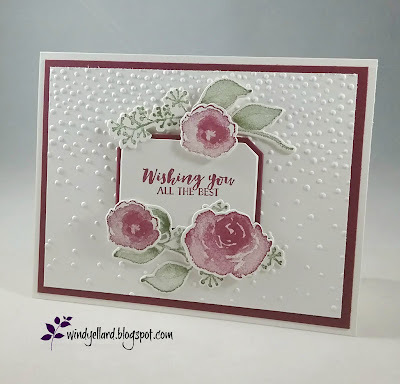 I stamped the flowers in two pinks-Blushing Bride and Berry Burst. I finished off with a little linen thread bow. use on each of their cards. stamped in same ink with some small flowers from the Time For Tea. and stamped the Calypso Coral sentiment. with the swag in Old Olive. 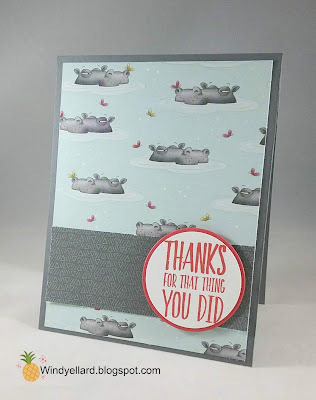 Sweet card for any friend! I love this set called Healing Hugs especially in Gorgeous Grape! 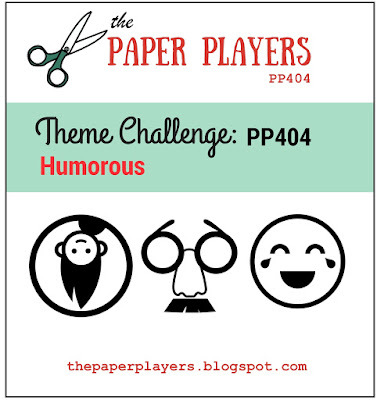 It is my third card for classes next week. I layered a piece of Grape over a white base. 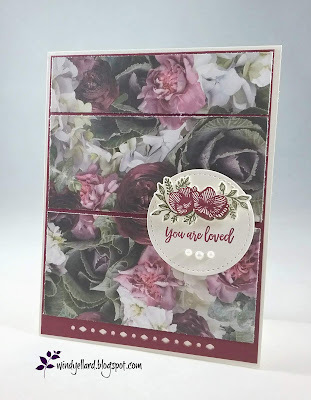 I stamped my roses in Grape and stamped off twice. 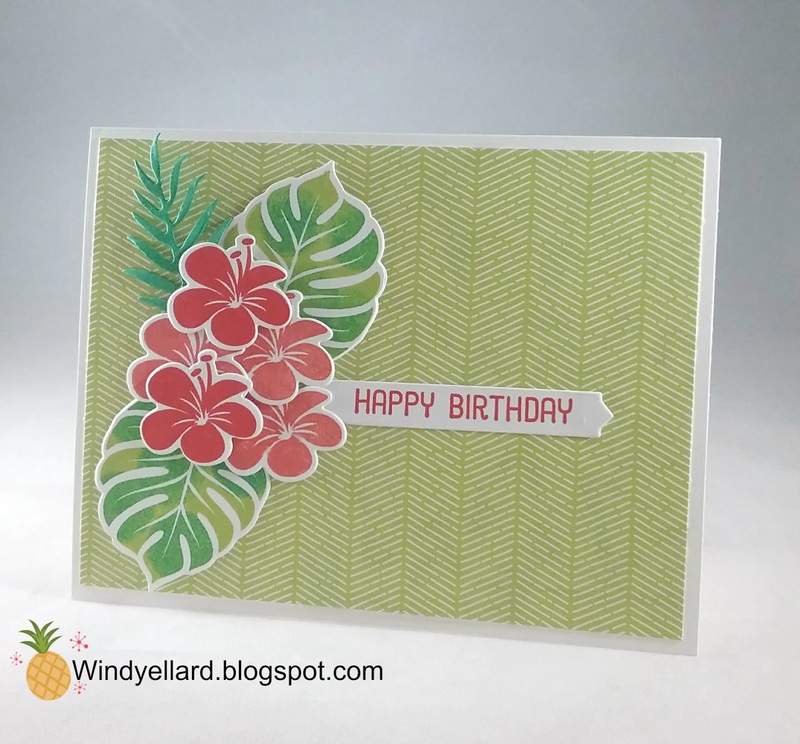 I stamped the leaves in Lemon Lime Twist. from the Healing Hugs set. 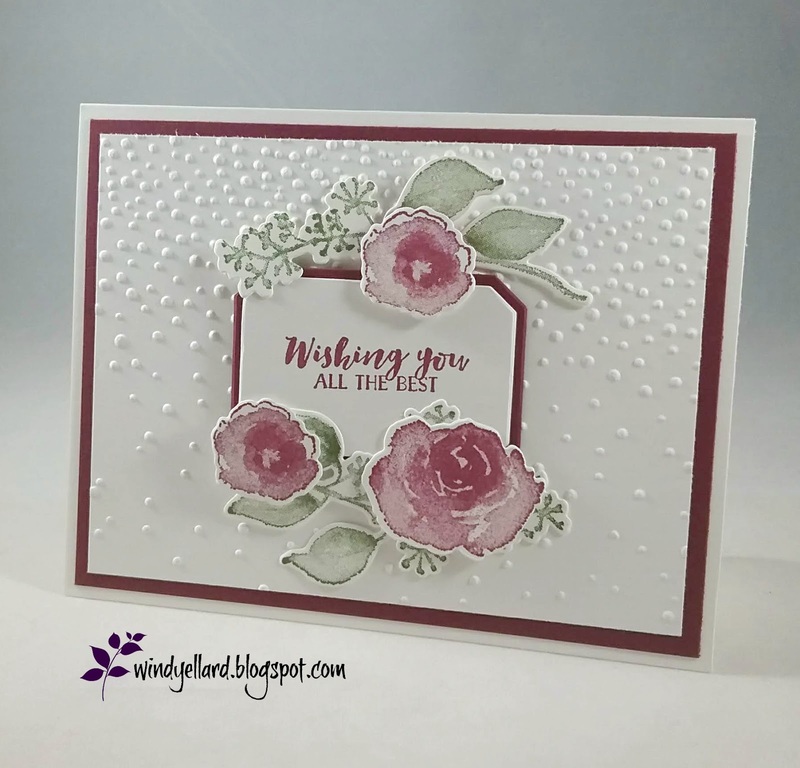 I finished it off with pearls for a little texture. For my second class card, I used the Follow Your Dreams bundle. in VersaMark and heat embossed it with white embossing powder. I layered a die cut on top in Gray Granite. to add to the catcher. I finished it with a white twine bow and a rhinestone. 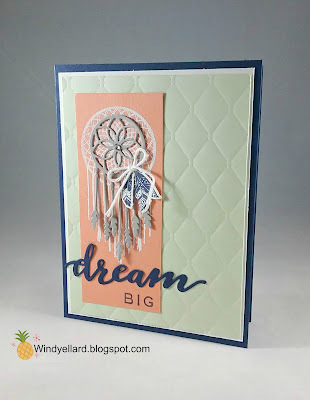 cut the Dream in Navy to add from the Chase Your Dreams dies. 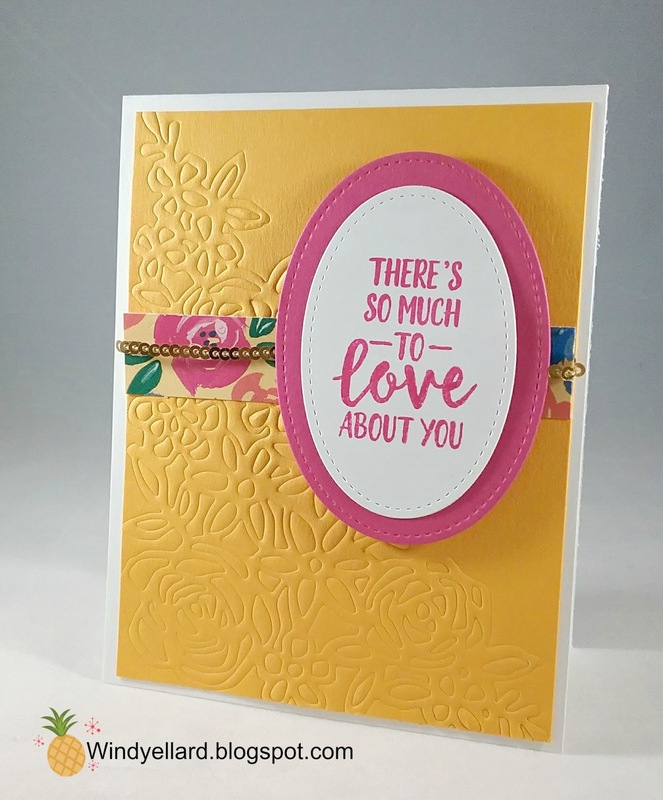 Big Shot with the Tufted embossing folder. A Layer of Whisper White and then a Navy base finished it off. I really like the texture and layers in this card. Thanks for stopping by and don't stop chasing your dreams! 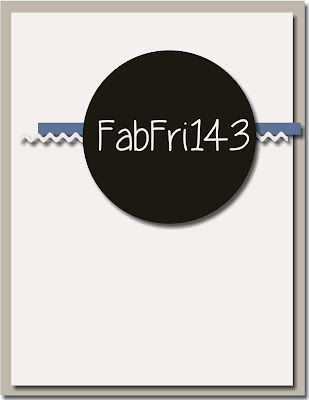 This is my first card for classes next week. great sentiments in this set called Animal Outings. and colored it with my Stampin Blends. in Memento Black and layered it with Calypso Coral card stock. 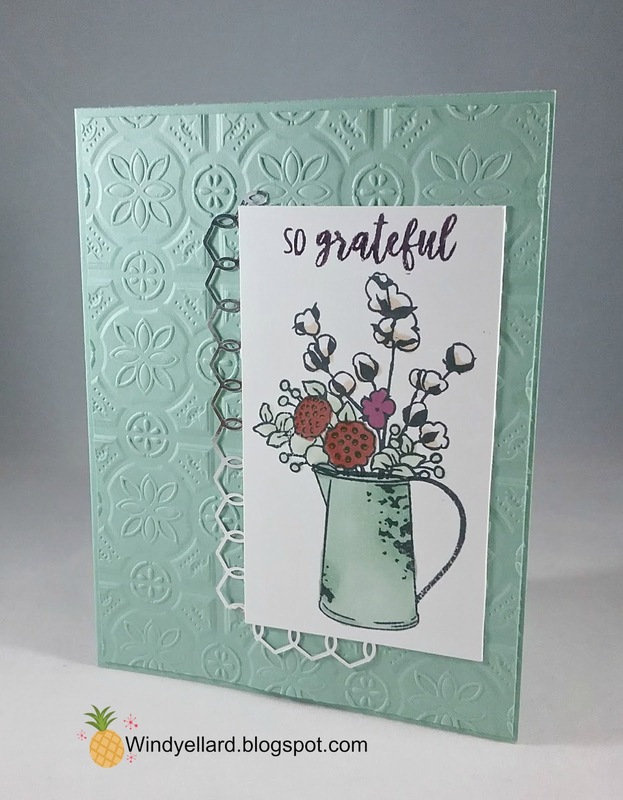 Layered Leaves embossing folder and place it all on a Crumb Cake base. 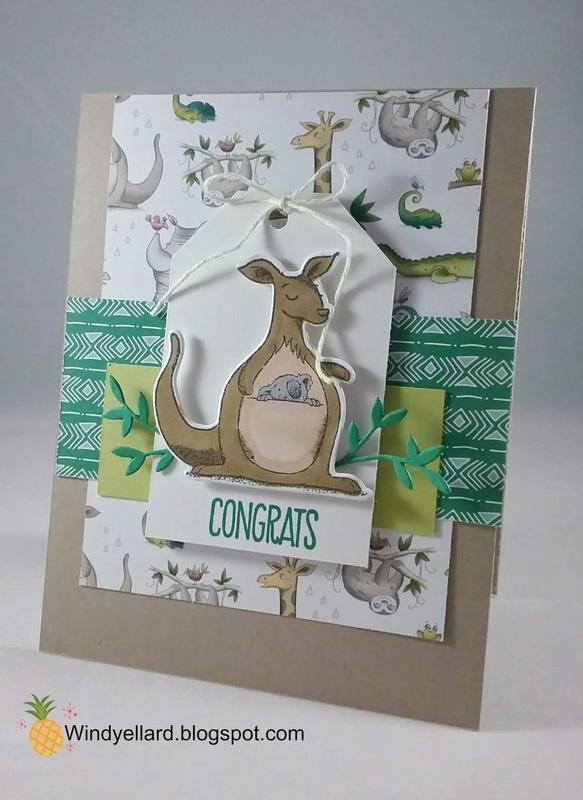 Cute card to send for several occasions! Hope you have a Wild day and thanks for stopping by! window into the sea for you! 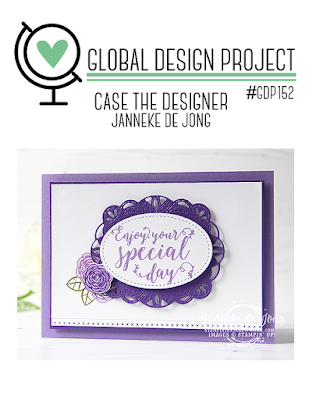 on white card stock and cut him with matching die. along with the Tranquil Tide and Soft Sea Foam plants. A smaller sand dollar in Mint Macaron. 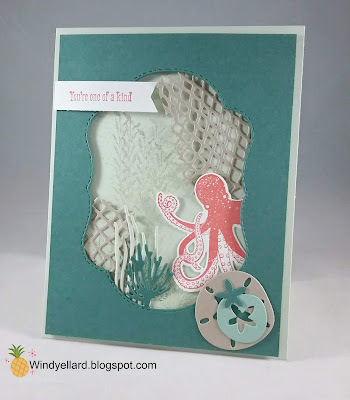 I stamped some texture and sea weed on the Sea Foam base for the background. 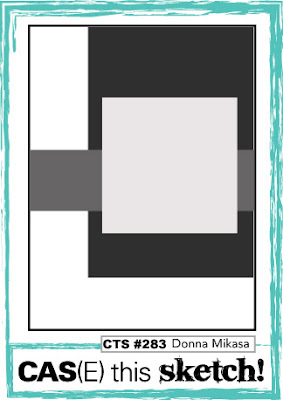 frame from the new for only this month Stitched Season dies. It does make a great window! 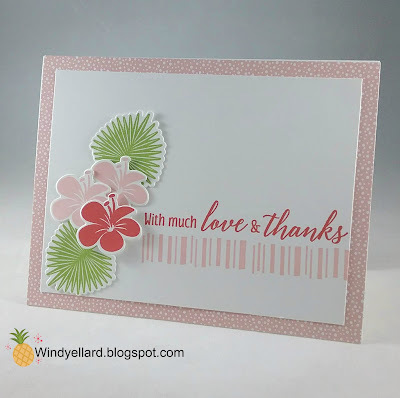 I finished it off with the sentiment stamped in Coral on a white banner. 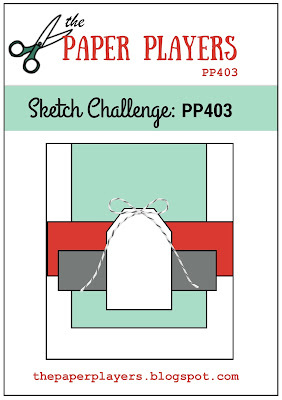 so was excited for this challenge! and it made me think to do this to look like a trellis. 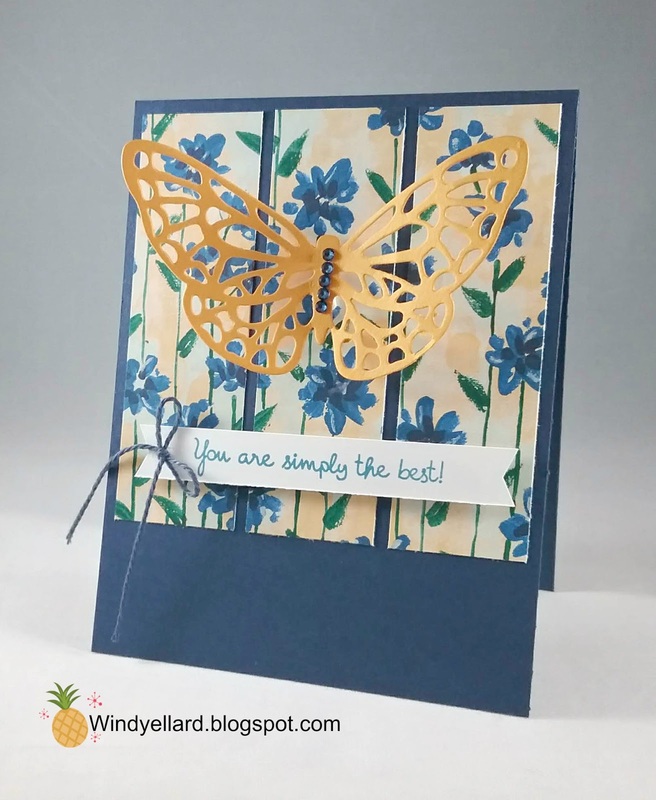 Whisper White and layered them on the Balmy Blue background. I cut it with the matching die. The sentiment is also in Black from same set. with Lovely Lipstick Stampin Blends. and hand snipped it out. and punched it out with the 1 1/4" scallop circle punch. label stamp and punched it out with the Pretty Label punch. To finish it off, I added the Lovely Lipstick 1/8" grosgrain ribbon. 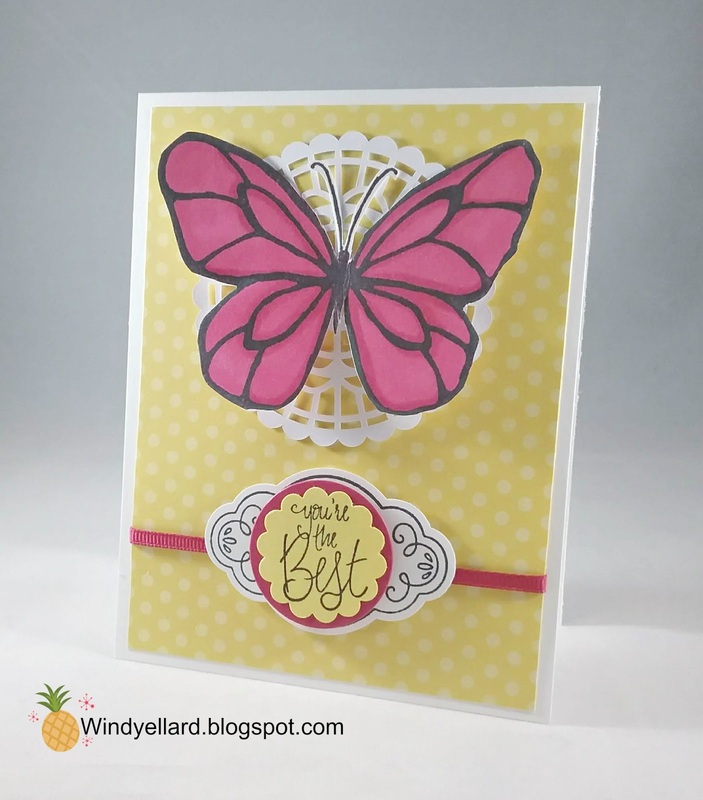 It is so easy to use the DSP and make a fabulous card! a layered on a Very Vanilla base. from the Beautiful Layers dies. I added some vellum behind for a vintage look. 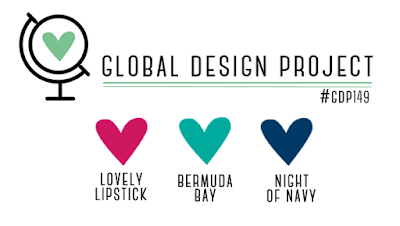 Love this suite of products! 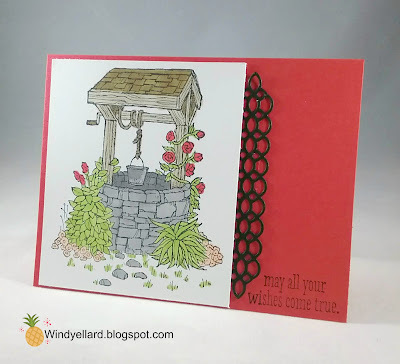 I colored the lovely well with my Stampin Blends. I used several colors and like the way it turned out. from the Petals & More thinlits dies. that we have a Stampin Blend in that color! for the center. I used Granny Apple Green on the leave. I ran through the Big Shot with the Tufted emboss folder. Great emboss folder by the way! white emboss powder on the Heather banner. Basic Gray base and then I used another print in gray for the strip across. Poppy Parade ink and t\layered it on another Poppy circle. I always love a three panel sketch! I decided I needed to use this great butterfly die again. 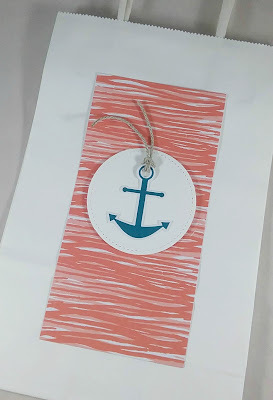 I colored with my Night of Navy Stampin Blends marker. at 1 1/4" by 4" each. 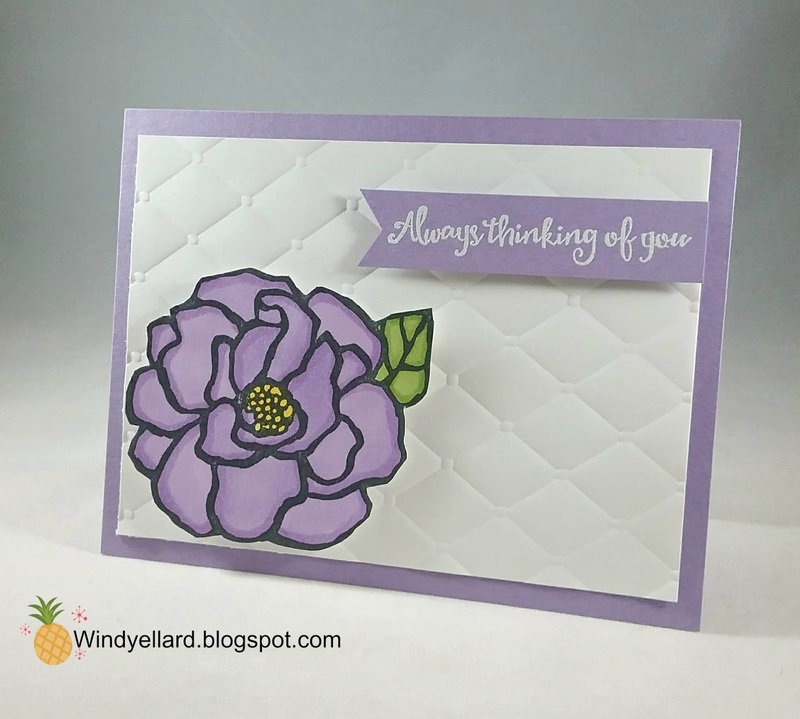 I thought the flowers stems were perfect for the panels. from the Varied Vases set. I added a little Navy twine bow to finish it off. 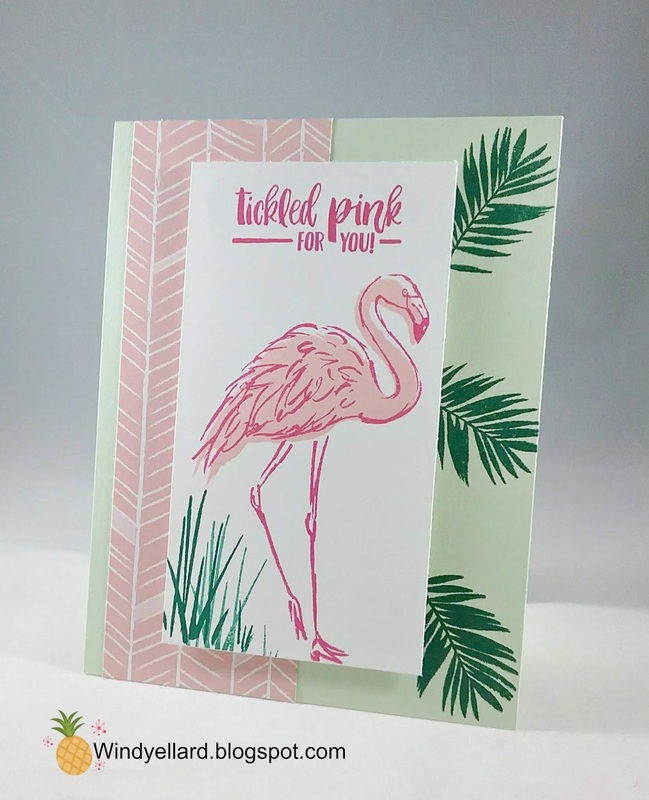 flamingo and any reason to play with this set is good enough for me! 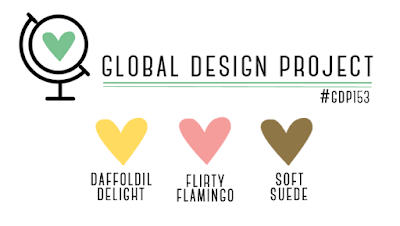 The flamingo always makes me smile! 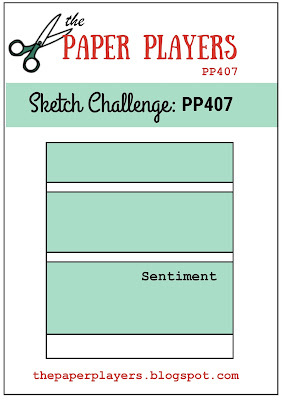 Blushing Bride and added the sentiment in Mambo. 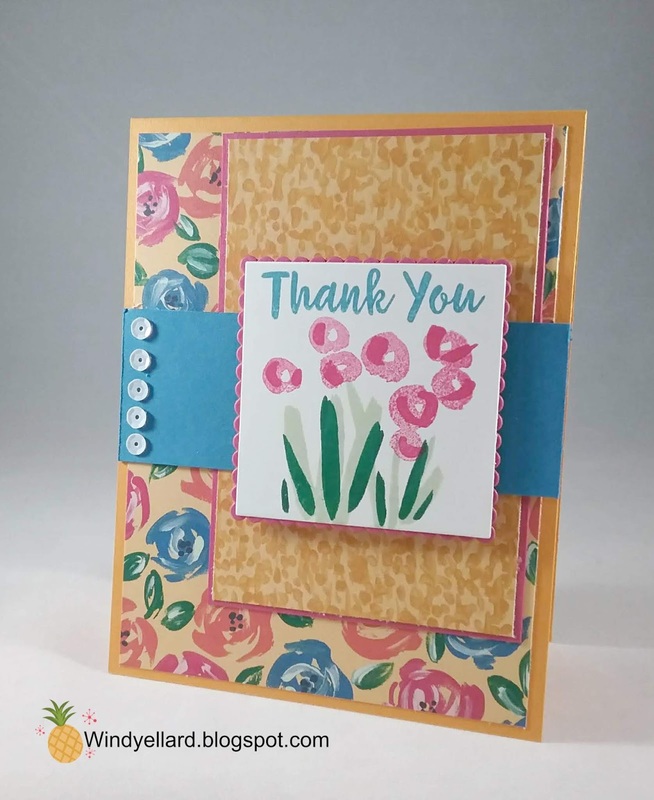 and layered a strip of Tropical Escape DSP. on dimensionals to the front. 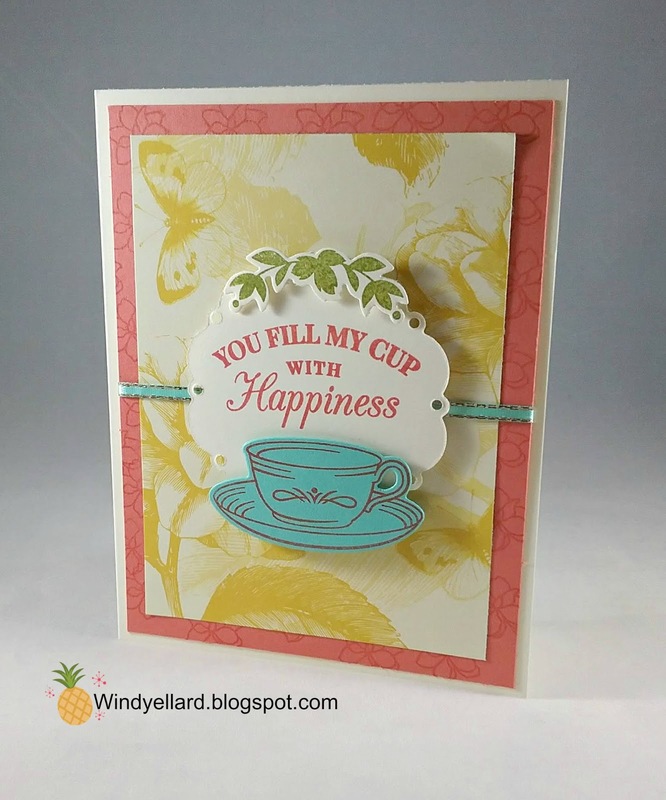 and my card made you smile! 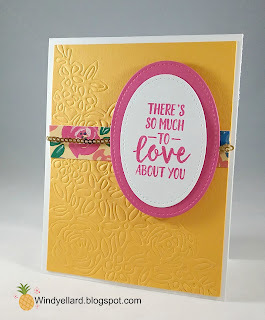 by using my embossing mats. 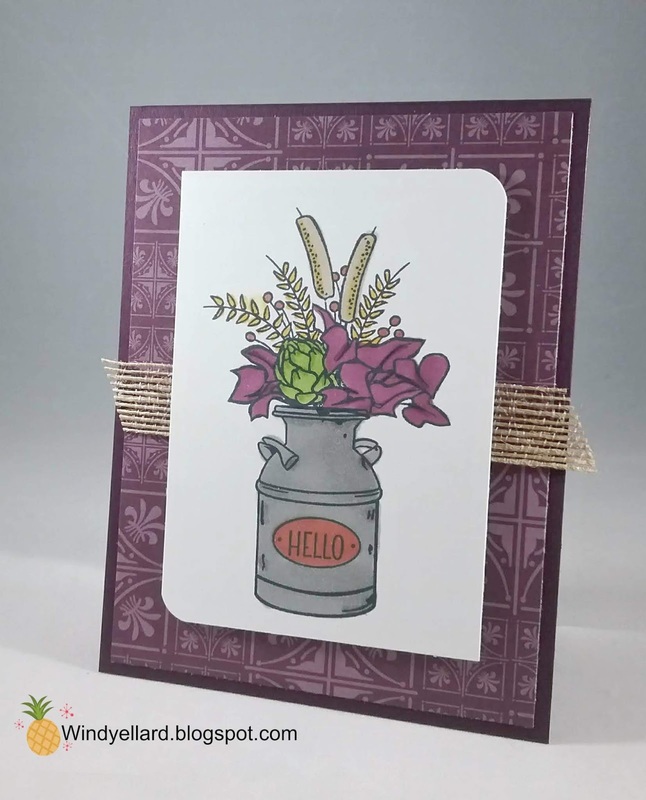 You can emboss with almost any dies. gold mini sequin around it. 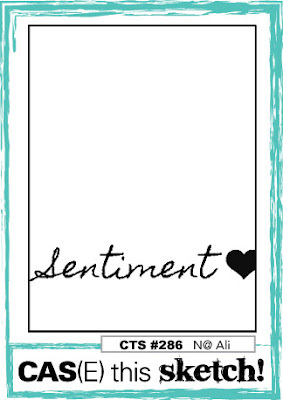 sentiment from Abstract Impressions set in Mambo ink. 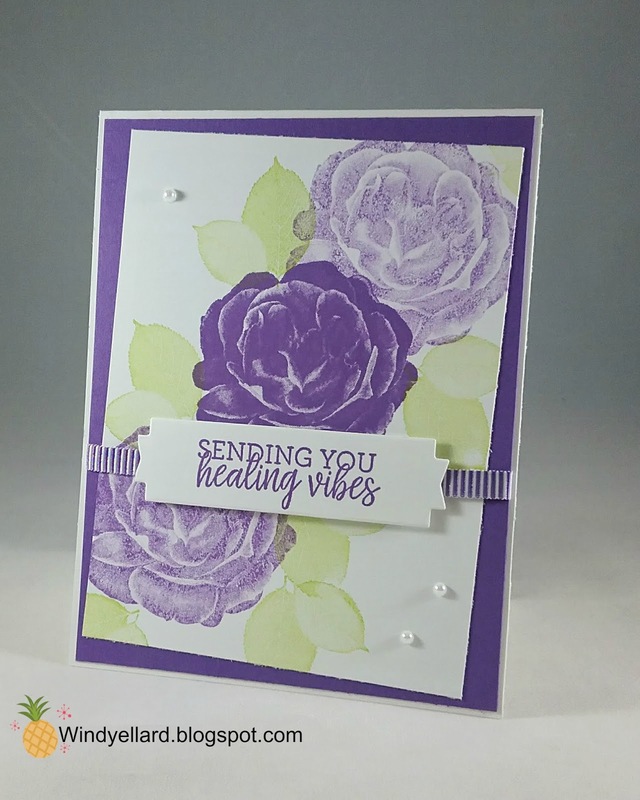 Simple but cool with the embossing floral! and not sure I lined them up right. 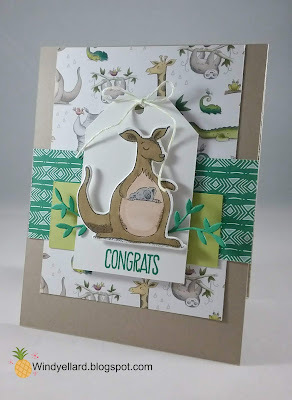 on the first stamp and full on with the next step. Abstract Impressions in Pacific Point ink. 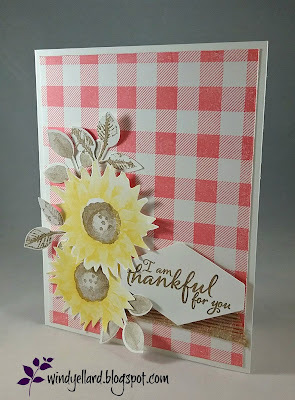 I cut the layering squares in white and Mambo. I layered those on a strip of Pacific Point. of Mambo and a base of Mango Melody. I finished them off with some white sequin on the strip. I like this sketch esp since I get to use even more DSP and layers! 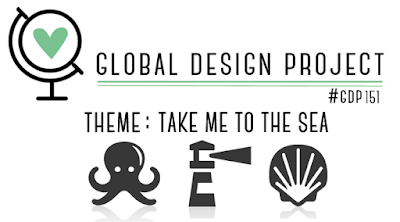 though a set of bright colored tea cups would be fun! Tea Room DSP with the pretty butterflies on the background. to the cups to finish it off. 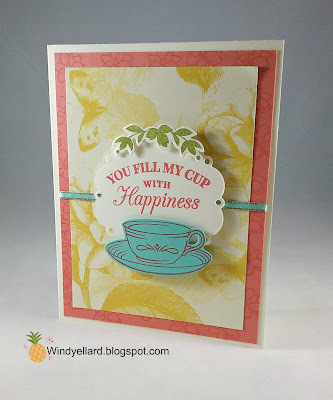 This card has already gone in the mail to my mom...she loves tea cups and pots. 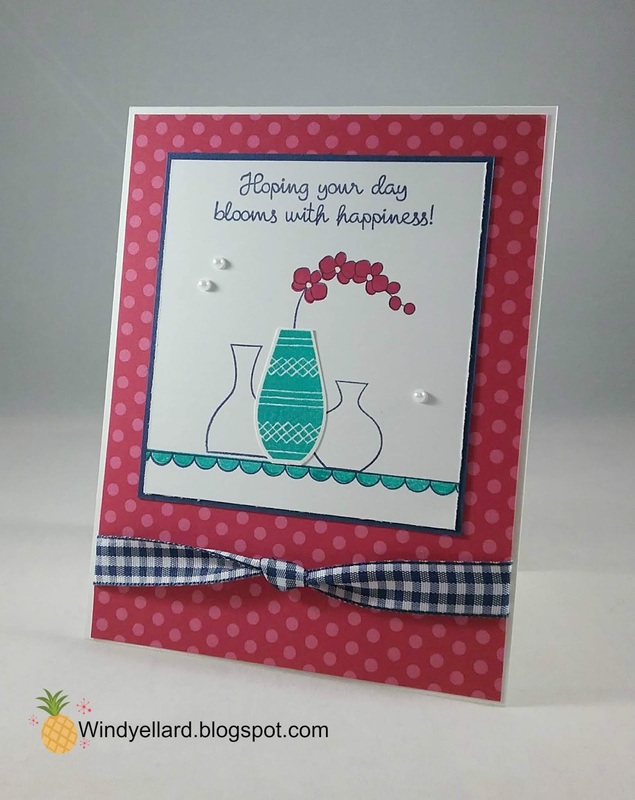 "I can use any color with the Varied Vases set and punch"
the matching Vase builder punch. 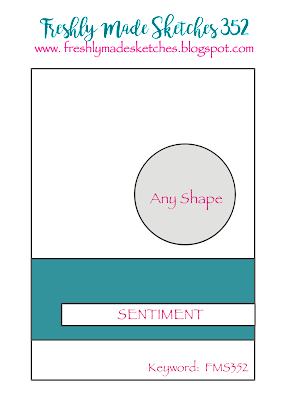 the sentiment and the scallop shelf outline. two of the shelf in Bay. sweet Lipstick dots DSP placed on the white base. to the bottom. A few pearls finishes it off.